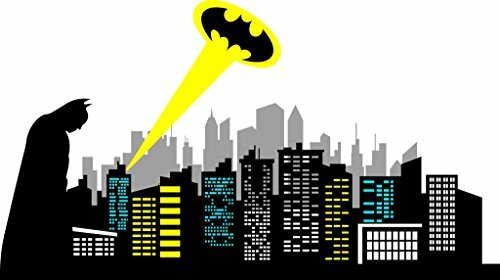 Chic Walls removable Gotham City Skyline Batman Silhouette Logo Ray of Light Wall Art Decor Decal Vinyl Sticker Mural Kids Room Nursery 120" X 67"
Our decals are interior safe and removable (not reusable) without damaging the surface. In contrast to other competitors who sell printed ink on a "white sticker," our decals are far superior. If you would like to add a name to the spotlight, please click on "Customize Now" button on the right side of the page. With each order you'll receive the following: Pre-masked vinyl decals that are ready to install, a small test decal for practicing and video instruction link for easy to follow step-by step tips. Chic Walls decals will stick to almost any smooth, flat surfaces including finished wood, metal, paint, glass, plastic, furniture, appliances, doors, windows, laptops, mirrors and much more. Our product are 100% made in the USA. Larger decals may come in multiple pieces for ease of installation. All of our skylines come in multiple pieces designed for overlapping and customization. Please refer to the photos for more information. If you have any questions about this product by ChicWalls, contact us by completing and submitting the form below. If you are looking for a specif part number, please include it with your message.